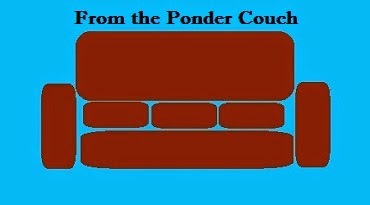 From the Ponder Couch: Idearrhea 4! 1. I like my pastries at room temperature. I don't mind that other people like their pastries hot, but I just don't care for what warmth does to the texture. I wish there was a reverse microwave. I know some of you are thinking "there is, it's called a refrigerator or freezer". While this does cool food down, it takes longer than I'd like. If I could get a cookie or piece of pie fresh from the oven, pop it in a reverse microwave for about a minute, and pull it out at room temperature, I would be a very happy Sethifus indeed. Alas, for now I'll just have to wait and eat my pastries when they cool down on their own. 2. I wish someone would make a ball pit, but instead of balls they would use big, puffy, hollow gold coins. I know I've seen them around, but I have not been able to find them in my google searches. The point of this fake coin ball pit is that then I could swim in gold coins like Scrooge McDuck! 3. Another thing I wish existed is a set of puppet features (eyes, nose, a hinged mouth) that had velcro or something like that so it could stick to most surfaces. That way you could turn any blanket, shirt, scarf, stocking cap, or other fabric into an improvised puppet! I think the Henson Studios and Disney could make a lot of money off of this idea. 4. They should make a chess set out of nail polish bottles and/or other beauty products. In my version of this each color of polish or different product would be a different shaped chess piece. That's all I got for now! More later, perhaps!